Sydney International Boat Show ticket offer! Bar Crusher’s NSW dealer Blakes Marine has planned an impressive line-up up of boats for next month’s Sydney International Boat Show – and the team wants to see you there! 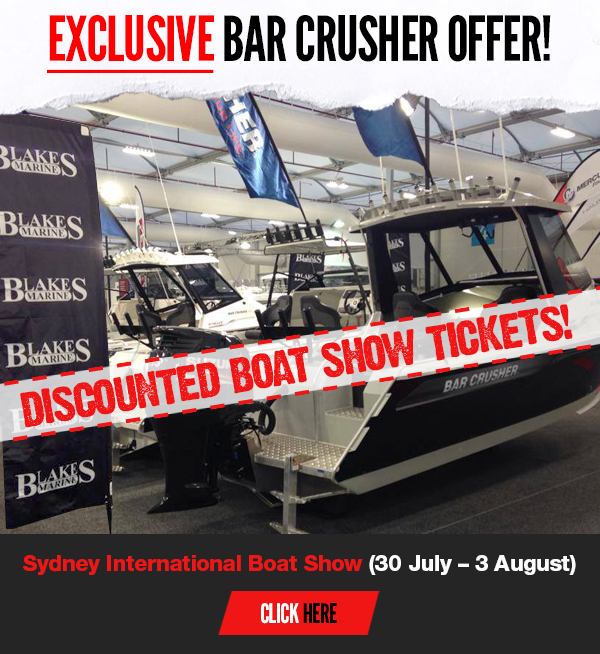 As a special offer to existing and prospective Bar Crusher owners, Blakes Marine has organised a promo code you can use to purchase discounted boat show tickets ($17 for an adult, instead of $21). Simply visit www.sydneyboatshow.com.au/buy-tickets.html, enter the promo code SWAYAK and select the number of tickets you want to buy. You must be quick! This offer is available only until 30 June 2015. To be held at the Sydney Exhibition Centre @ Glebe Island from 30 July to 3 August, the 2015 Sydney International Boat Show is shaping up to be another awesome event. Speak with Blakes Marine at the show about some great deals on new Bar Crusher boats – from the pocket rocket 490C right up to the flagship offshore Fishing Weapon, the 780HTP.